Ackermann’s Repository of Arts, December 1817. 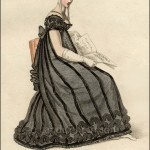 This mourning dress commemorates the death of Princess Charlotte who had died on November 6, 1817 at age 21, after giving birth to a stillborn son. Though the model’s face is appropriately somber, even sad, she is dressed for a formal evening — either a party, a ball, or some other form of entertainment. 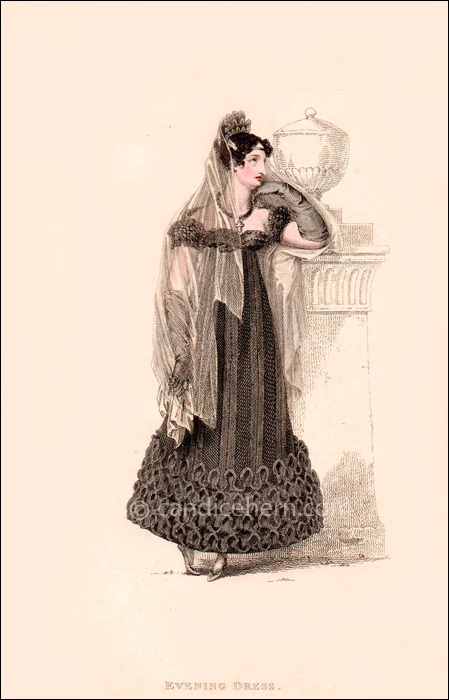 Though the type of clothing is strictly prescribed for court mourning, in terms of color and fabric, social activities were not much curtailed. It appears to have been sufficient to wear clothing that honored the deceased person, without the need to restrict social activities. This was not true for personal mourning. 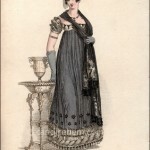 If a woman lost her husband, for example, she would have no need for a black evening dress as she would not be expected to do any socializing. This dress represents full, or deep, mourning. During this first phase of mourning, fabrics were to have no sheen or shine, and no sparkly jewelry was allowed. Jet jewelry was considered appropriate.